I don’t think I have really LIKED a Roland Emmerich film since INDEPENDENCE DAY, and that is a movie I have carefully avoided for fear that my adult brain will reject what my teenage brain loved. I’ll see Emmerich’s films. They are usually somewhat funny, mostly entertaining, mind-numbing, popcorn-assaulting, blunderbusses. It is in this spirit that I finally saw WHITE HOUSE DOWN. I watched WHITE HOUSE DOWN (2013) on 4.19.14. It was my first viewing of the film. WHITE HOUSE DOWN will always be compared to the movie which also hit theaters around the same time: OLYMPUS HAS FALLEN. History tells us that one will be remembered and the other forgotten. In that vein we remember ARMAGEDDON over DEEP IMPACT, even if there could be some debate about which is better. Most likely, a decade from now, people will remember WHITE HOUSE DOWN. 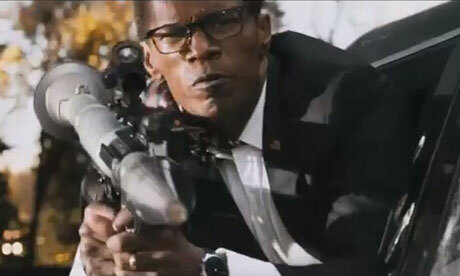 It has bigger names in Jamie Foxx and Channing Tatum fighting alongside Maggie Gyllenhaal against James Woods. The PG-13 rating makes it friendlier for families. The detachment from reality is planned, even as innocent people are murdered. A young man, Cale (Tatum), has a job interview to be in the Secret Service. It doesn’t go well because he would seem to have had a fling with the interviewer, Finnerty (Gyllenhaal). Despite the bad news, Cale takes his daughter (Joey King) on a tour of the White House since they are there anyway. Terrorists attack and Cale becomes the savior as he attempts to find and protect the President (Foxx). The movie wants to be DIE HARD mixed with THE ROCK. Cale is the McClane character: trained to do what he is doing even if he isn’t supposed to be in the situation. The villainous James Woods character is straight up lifted from Ed Harris’ General Hummel from THE ROCK. Only, and this is hard to admit or type, Roland Emmerich is not as good as Michael Bay at getting the most out of the depth of character from his villain. At one point Woods delivers a line which mentions that shooting a friend was “The second hardest thing he’s ever had to do in his life”. Only, for some reason, we never see that struggle in the moment. The movie is too busy thrusting its phallic plot around every corner to be concerned with minutiae like character. Which is not to say that WHITE HOUSE DOWN does not provide an entertaining experience. The wit gets laughs and the action is solid. There is a true sense of ra-ra patriotism by the film’s end which gets points even if those points seem cheaply earned. WHITE HOUSE DOWN may use a potentially devastating premise to provide nothing but the simplest action appealing to the lowest common denominator, but then that is basically the definition of the action genre anyway. There is a ton of silliness, like the President finding a rocket launcher in his limo. There is a good amount of poor CGI, as almost the entire world was added in post. There is no depth to plot or character decisions whatsoever. But, as long as you know what you are getting into, there is absolutely nothing wrong with WHITE HOUSE DOWN. Just keep your expectations low, and you’ll be perfectly satisfied. ~ by johnlink00 on April 21, 2014. Sometimes it’s a little too dumb to really like, but it does have a good time with itself. Which, considering it’s a summer blockbuster, isn’t such a problem. Good review John. Thanks! And I know what you mean. It has a few moments which are real ‘nuke the fridge’ moments. But it is not asked to do too much.